Since it was first authorized in the 1996 farm bill, USDA’s Environmental Quality Incentives Program has grown into the single most important federal program that helps farmers and ranchers protect farmland and the environment as they grow America’s food. Thanks to the conservation practices farmers have put on the ground with help from the program, known simply as EQIP, the water is cleaner, farms are more productive and rural America is a better home for wildlife. That’s why it is critically important that Congress resist efforts to weaken or cut its funding in this year’s debate over renewing the farm bill. Through 2010, EQIP provided $4.2 billion in payments to landowners through 309,376 contracts in every county of the United States. Moreover, a new EWG analysis, based on data from USDA’s Natural Resources Conservation Service, shows that from 1997 to 2010 nearly a quarter of total EQIP dollars – $1 billion – was spent to help farmers buy irrigation pipeline, more efficient sprinkler systems and other equipment. At first glance, this makes perfect sense. Water conflicts in the West are growing and agriculture accounts for 80 percent of U.S. consumptive water use – water that is never returned to the environment. The problem is particularly acute across the seven-state region where farmers are tapping the so-called High Plains Aquifer to water their crops. About 99 percent of this water is for agriculture, and the water table has fallen by more than 150 feet in some areas. So, buying farmers more efficient irrigation equipment means more water stays in the aquifer, right? A new study about groundwater running dry in western Kansas, recently cited in The New York Times, shows that helping farmers to buy more efficient infrastructure alone is not enough to address this critical problem. The findings underscore the urgent need for a program like EQIP, but also emphasize that to fully protect the nation’s vulnerable and diminishing water resources, it must be strengthened and improved. Dr. C.-Y. 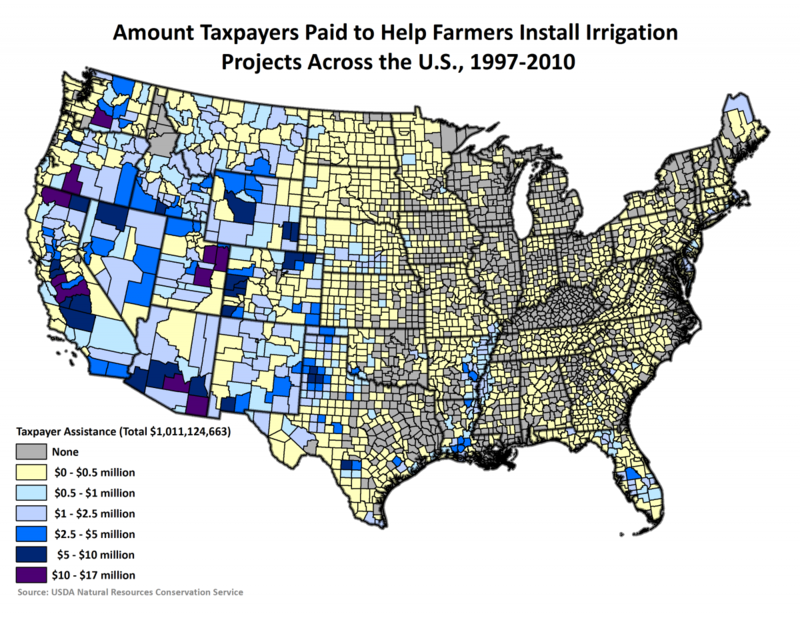 Cynthia Lin and Lisa Pfeiffer of the University of California Davis looked at water use in the High Plains Aquifer to assess the effects of subsidizing farmers to buy better irrigation infrastructure. They specifically focused on whether taxpayer-subsidized conversions to more efficient sprinkler systems had the desired effect of slowing depletion of the aquifer. After examining data from more than 20,000 farms from 1996 to 2005, they came to the conclusion that the taxpayer subsidies were actually making the situation worse. That’s because farmers who were able to save water by using more efficient equipment often decided then to switch to crops that required more water, chose to irrigate more acres, or both. Overall, the result was that the farmers pumped more water out of the ground, not less. Lin and Pfeiffer concluded that rather than conserving groundwater, farmers likely “used their efficiency ‘savings’ to expand irrigated acreage or apply more water per acre.” Subsidizing farmers to install more efficient irrigation alone did not protect the aquifer. It will take additional measures to make sure that more efficient water use actually help preserve the aquifer. Legislation just introduced by Rep. Earl Blumenauer (D-Ore.) and Sen. Tom Udall (D-N.M.) would do exactly that. Their legislation (House version, Senate version) would ensure that any water saved by more efficient, taxpayer-funded irrigation systems will stay in the aquifer or the associated streams and rivers. Sen. Udall plans to offer an amendment to make this critical improvement in EQIP during Senate floor debate on the farm bill. In the West, where agriculture is by far the largest water user, protecting the limited supply is also critically important. Agriculture must be the primary focus for reducing consumption, and EQIP and other USDA conservation programs must be better used to meet the challenge. The issue is not limited to just parts of the country, however. Earlier this year, a U.S. Geological Survey report examined the withdrawal and recharge rates of 40 aquifers across the country from 1900 to 2008. Its researchers found that over the course of the 20th century, those aquifers lost about 7.5 million more acre-feet per year than they gained (One acre-foot equals a suburban household’s water use for a year, or about 250,000 gallons.) And from 2000 to 2008, the annual deficit increased to 20.2 million acre-feet per year, a nearly 250 percent increase over the historical pattern. That deficit is the equivalent of the water used by all of the households in Texas over 2.5 years.